Misty Copeland, the first female black principal dancer for the American Ballet Theatre, has been in the news and mentioned on social media again and again over the past few years. She's also become quite well known in the world of children's literature. For young readers, she's been featured in You Should Meet Misty Copeland, When I Grow Up: Misty Copeland, and A Girl Named Misty: The True Story of Misty Copeland. Misty is obviously a role model for many young girls and has even written a picture book of her own -- Firebird -- that uses her story to inspire girls everywhere to reach for their dreams. But who inspired Misty Copeland? 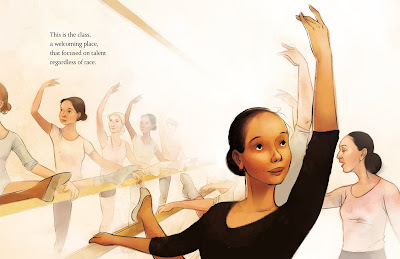 The answer is someone you may or may not have heard of -- someone featured in the picture book Trailblazer: The Story of Ballerina Raven Wilkinson, written by Leda Schubert and illustrated by Theodore Taylor III. I feel very privileged to have learned about Ms. Wilkinson's powerful story through this book, which is full of details and sometimes sobering illustrations that really help the reader settle into the story's historical time and setting. "When I was twenty-three years old, I watched a documentary called Ballets Russes. 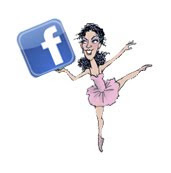 This was the day my life and my purpose changed," Misty Copeland writes in the foreword of the book. 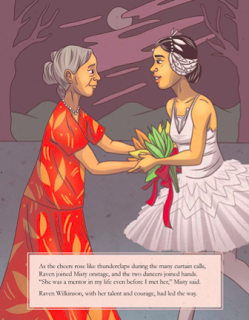 "I discovered a black ballerina named Raven Wilkinson, and it was in her that I saw myself and what was possible." Misty was already a professional ballerina when she learned about Ms. Wilkinson, and now is honored to call her both a mentor and a friend. Trailblazer begins with a young and passionate Raven seeing the famous Ballet Russe de Monte Carlo perform when she was just five years old. 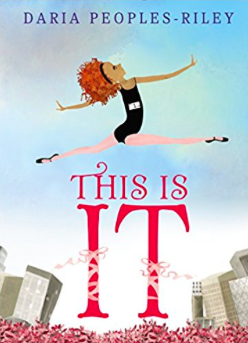 It then takes readers through Raven's childhood and difficult journey to become the first black ballerina to dance with the very same company. After Raven first auditioned for the Ballet Russe de Monte Carlo, a friend told her that she wouldn't be able to join because she was black. That didn't stop Raven, who auditioned again, and again, until the director asked her to join the company in 1955, when she was just 20 years old. As the Ballet Russe de Monte Carlo toured the country, Raven faced many challenges. The Ku Klux Klan was active, it was illegal in some states for black dancers to perform alongside white dancers, and men even rushed the stage once during a performance to object to Raven's presence. 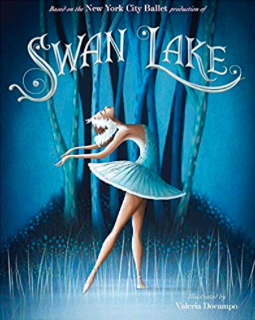 One of the last straws for Raven was when she was told by a ballet mistress that she would never be able to dance the lead role in Swan Lake because she was black. She left the Ballet Russe in 1963, though she did later dance and act with other groups in Europe and the United States, and she led the way for many black ballet dancers who came after her. She was a trailblazer! 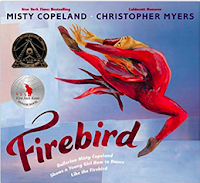 The book ends with an intersection of Raven's life with that of Misty Copeland. 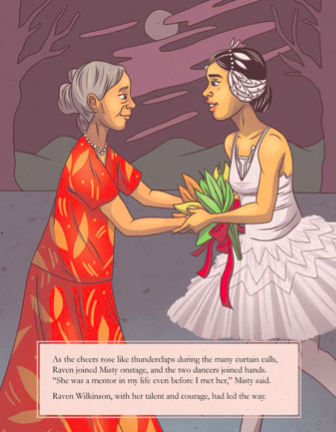 In 2015, Misty Copeland became the first black ballerina in a prominent American ballet company to dance the lead role in Swan Lake, and Raven Wilkinson was there to celebrate with her! 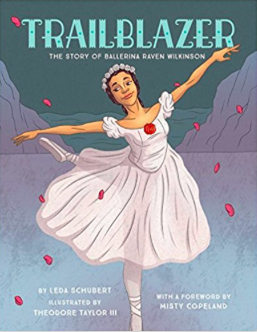 Thanks to publisher little bee books for a review copy of Trailblazer: The Story of Ballerina Raven Wilkinson, which was released in 2018. 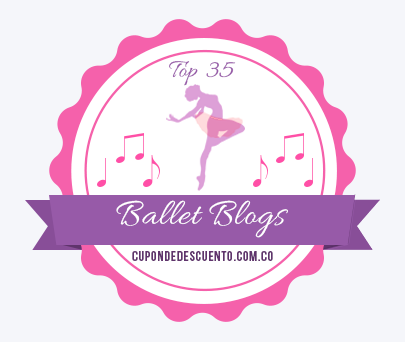 All ballerinas are brave to get up on stage and share their talents with an audience. 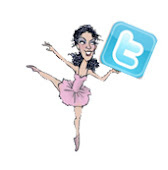 But one ballerina in particular--Janet Collins--had to be braver than most. A black girl born in New Orleans in 1917, Janet had to overcome extraordinary racial prejudice to be given the opportunity to even dance on a stage at all. 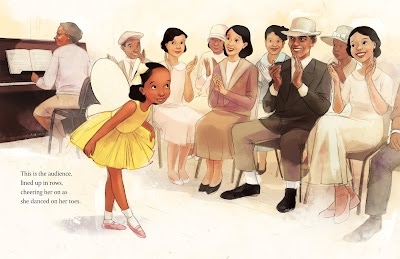 According to the author's note in the back of the new picture book Brave Ballerina: The Story of Janet Collins, Janet was once told she couldn't join a dance company unless she painted her skin white! I'm thrilled to have the author of this new book, Michelle Meadows, on my blog today to share her inspiration and process for writing this story. I've followed Michelle's career since my two daughters were in preschool, and I love the infectious rhyme in her books, including Pilot Pups, Piggies in the Kitchen, Super Bugs, and more. Brave Ballerina is Michelle's first nonfiction book for kids. Congratulations on such a beautiful book! You write about this a little bit in the author’s note at the back of the book, but what inspired you to write about Janet Collins? I was taking a wonderful ballet class when I started researching black ballerinas. I also was so excited when Misty Copeland was named the first black female principal dancer with the American Ballet Theatre. When I started looking into history, I learned that Janet Collins was the first black principal dancer with the Metropolitan Opera House. 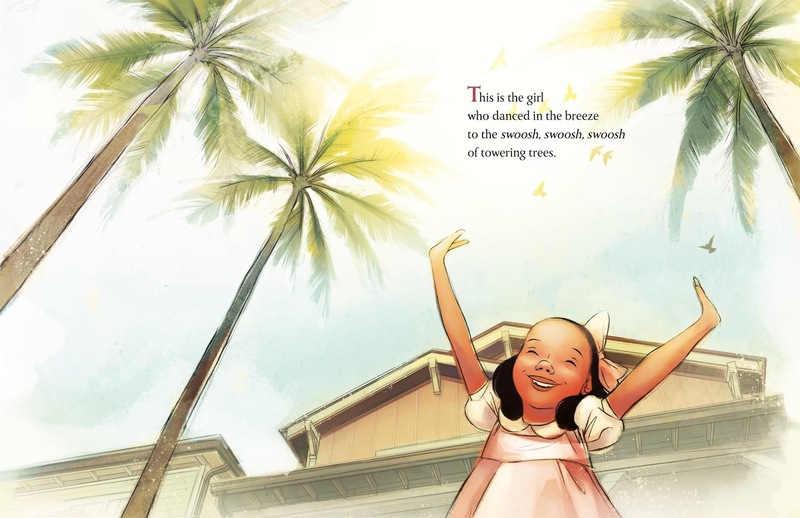 This was news to me, and I thought a picture book would be a great way to educate others about her inspiring story and her passion for dance. 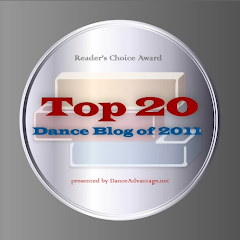 Did your own experiences with dance affect any aspect of writing this book? Definitely! I took ballet as a child and have always loved it. Taking ballet as an adult brought back some nice childhood memories. Doing the movements and dancing to music helped me with the language and rhythm of the text. 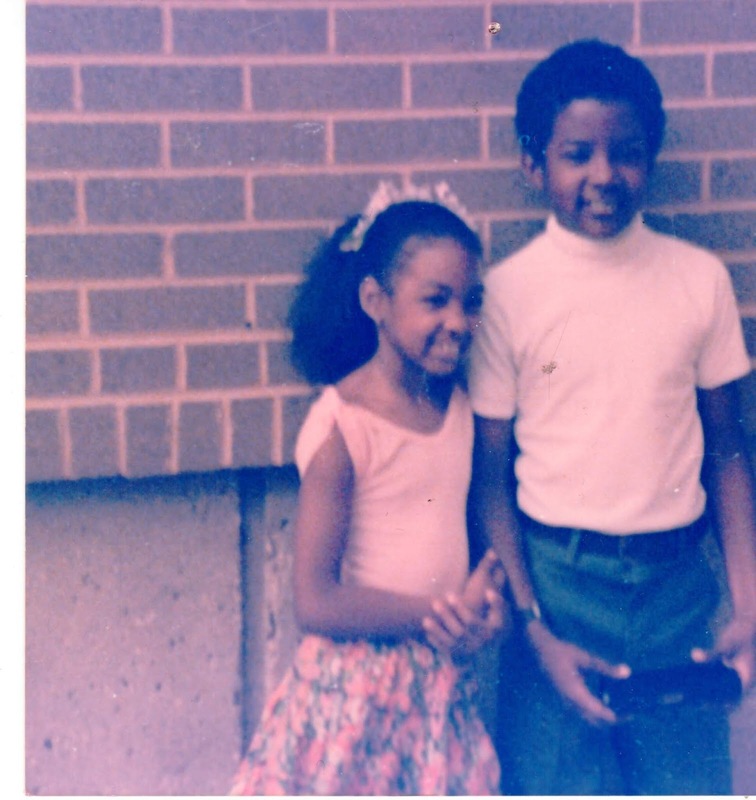 Before I move on to my next question, I have to share this adorable photo of you as a little girl, with your brother Marcus, after one of your ballet recitals. A great throwback shot! All of your previous books have been in rhyme, but I was somehow expecting this one to be in prose. Maybe it’s because I haven’t seen too many picture book biographies out there in rhyme. But I love your approach! 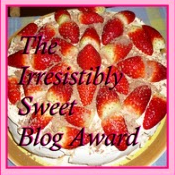 Did you ever consider writing this one in prose, or did it come to you in rhyme from the start? I love rhyme! I really love the music of language, and rhyme is so much fun to write. I often start out in rhyme. For this book, I actually started out in prose and it wasn’t working. When I switched to rhyme, things clicked into place. It felt natural and true to the subject matter. 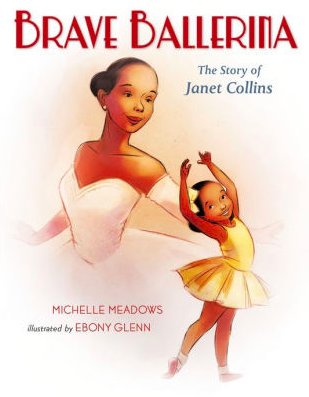 This book covers a lot of time, from Janet Collin’s early childhood to her rise as a prima ballerina, yet you cover this span of time in very few words. How did you go about deciding what to include in the book and what to leave out? 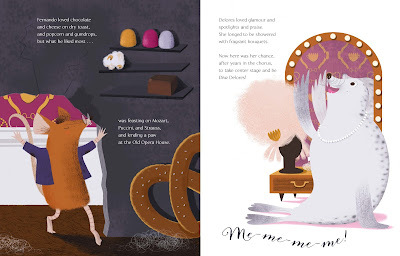 One of my favorite things about Brave Ballerina is the “This is the” phrase that is repeated frequently throughout the book as each new concept is introduced. How did you come up with this approach? In addition to taking ballet while working on Brave Ballerina, I was volunteering to help kids with reading at a local Boys & Girls Club. I was spending a lot of time with children in first and second grade. I thought about how I would tell them this story about a girl who swayed with the palm trees in her yard as a child. “This is the girl who danced in the breeze…” popped into my head, and I let things roll from there. I find the illustrations by Ebony Glen to be very expressive and endearing, especially in terms of the facial expressions for Janet Collins. What was your reaction when you saw the illustrations for the first time? Joy! Gratitude! 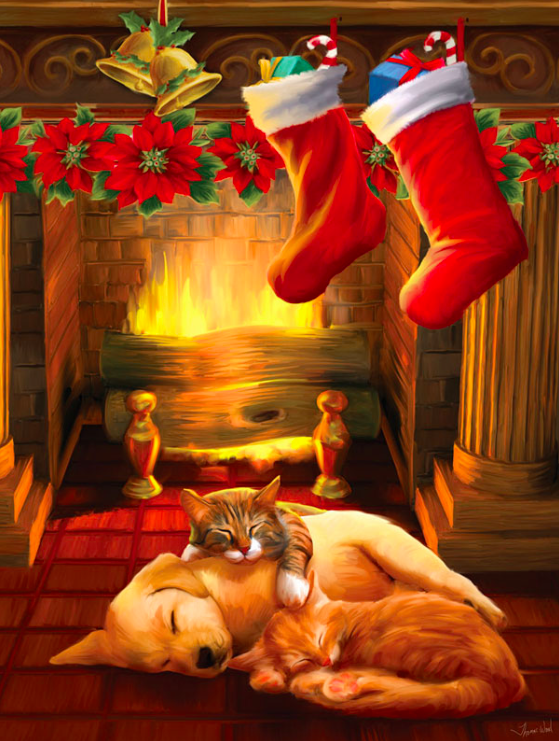 More joy! I love everything about Ebony’s illustrations. They are more beautiful than I could have imagined. 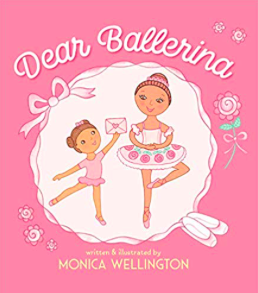 As Brave Ballerina has been on bookshelves for a few weeks now, have you heard anything about the early response from readers? I can imagine the book is already inspiring many young children! I have heard from parents and teachers who are very enthusiastic about the book. I recently posted a teacher’s guide for the book on my website. 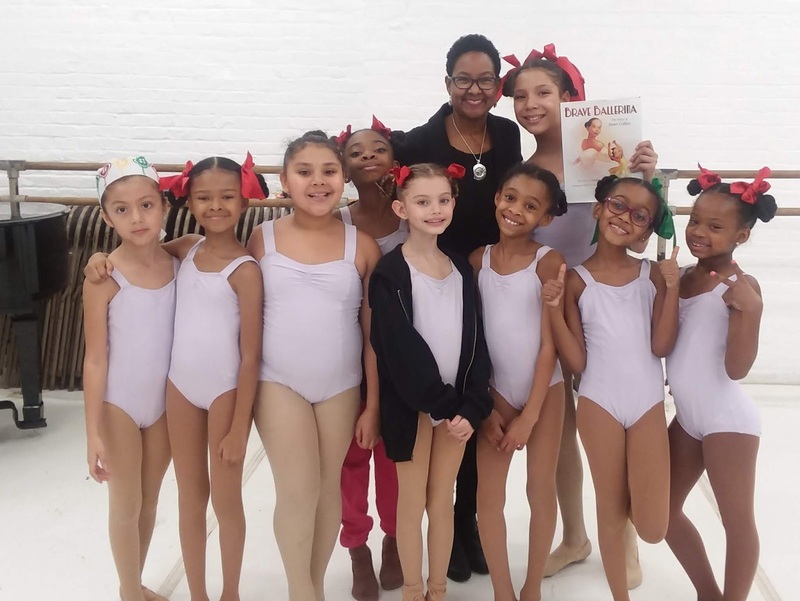 I also had the opportunity to share the book with students at the Dance Theatre of Harlem school, and they were excited. My husband and I watched the students dance in a show, and it was really special to think that it all started with Janet Collins! Are there any projects in the works right now that you are able to share with us? Yes, Ebony and I are working on another picture book with Holt/Macmillan--a picture book biography of Olympic gymnast Simone Biles. I am thrilled to have the opportunity to work with Ebony again, especially on a book about such an amazing gymnast. I would do a backflip about it if I could! I am sure lots of little girls and boys will soon be doing backflips for you! 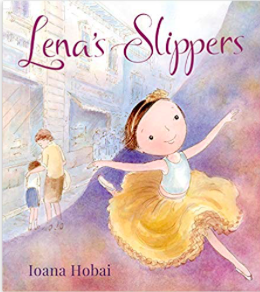 Thanks so much for letting us know about your upcoming book and for sharing some of the backstory for Brave Ballerina! 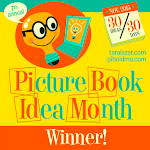 Visit Michelle and learn more about her picture books at www.michellemeadows.com. The signs of Halloween have been hard to miss. Decorations on doorsteps. Thriving Halloween pop-up shops. 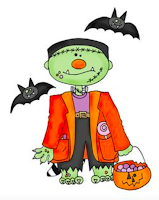 Costume parades at many preschools and elementary schools this week. 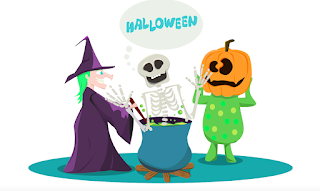 Tonight was finally the night for many of us to hover behind our doors, waiting for the bell to ring so we could be charmed by all those darling costumes and all those little voices reciting "Trick or Treat!" Well, here are two treats of a different kind, delivered straight to your computer screens this Halloween evening...or perhaps a day or so later by the time some of you read this. 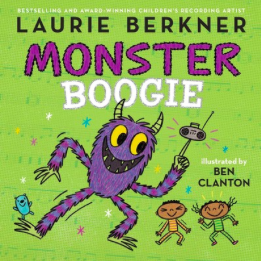 The second treat is the new picture book Monster Boogie by Laurie Berkner and Ben Clanton. 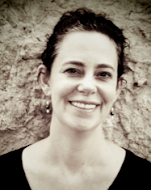 In addition to being an author, Laurie is a singer and songwriter with many a catchy tune for young children under her belt. 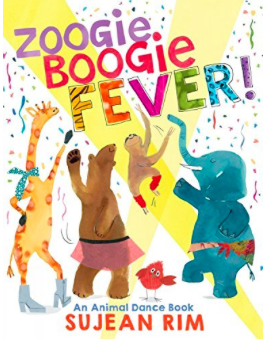 Monster Boogie is actually one of her songs turned into a book! 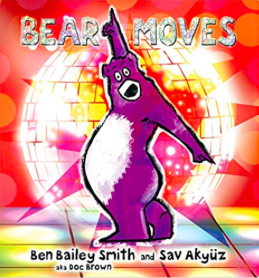 The big purple monster you see on the cover of the book does the "monster boogie" and the "monster wiggle" with a young brother-and-sister duo all "round the room." As you'll see from the following YouTube video of Laurie singing the song for a group of children in monster masks, it is very infectious! 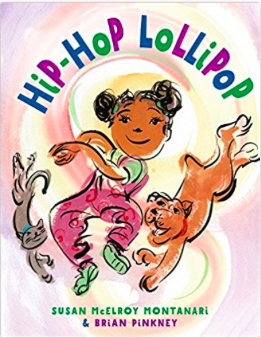 This book is perfect for getting kids moving -- at home, during story time at the library, or in a dance class. 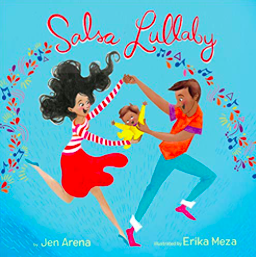 And don't forget to play the song after reading the book to really get the kids moving around your room! Diva Delores is a big seal, with an even bigger ego, who's finally graduated from the opera chorus to center stage. But she's a little too full of herself to admit she might need help preparing for her new role. 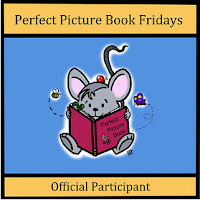 Fernando is a tiny, ultra-cute mouse who has all the knowledge and talent to help Delores succeed. But will she let him? 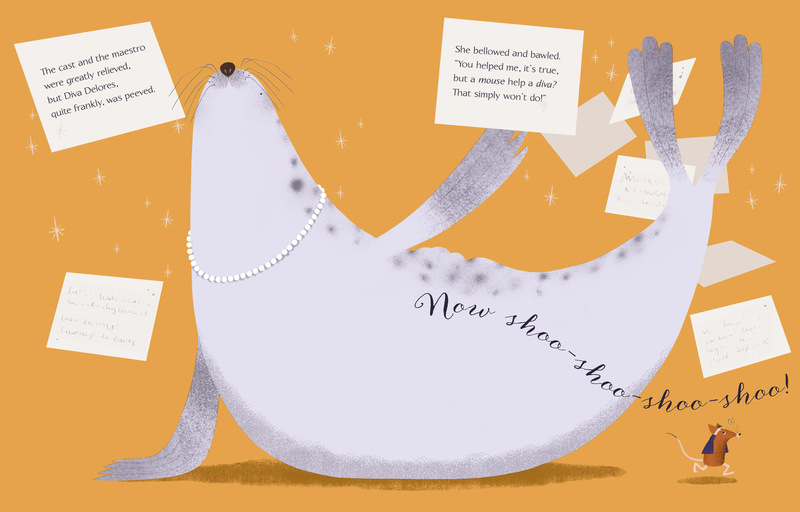 Thanks, also, to Sterling for letting me include a couple spreads from the book in this post. There's a lot to cover, so let's get started! 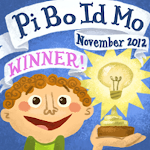 What was your favorite part of illustrating this story? Do you have a favorite stanza or stanzas from the book? but a mouse help a diva? What was your favorite part of writing this story? My favorite part of writing this story, once I had settled upon the story's structure in terms of meter and rhyme, was to play with plot and wording until the story sang! And I love Rebecca's response to the illustrator's version of this question, because for me, too, it was loads of fun (and hard work) to really develop Delores' and Fernando's characters and to think about what made each one tick...and how to convey that within the framework of a rhyming text. It was a truly joyful moment for me when I had the idea to add the varying "Tra-la-la-las" at the end of the certain spreads to convey Delores' inner mindset, and eventually, her growth. Once I added that element, I knew the manuscript was getting close to submissions stage. Do you have a favorite illustration from the book? This is an extremely difficult question because I am smitten with each and every one of Rebecca's charming illustrations! However, since story beginnings are very important in capturing and keeping the reader's attention, I think I will choose the opening spread. 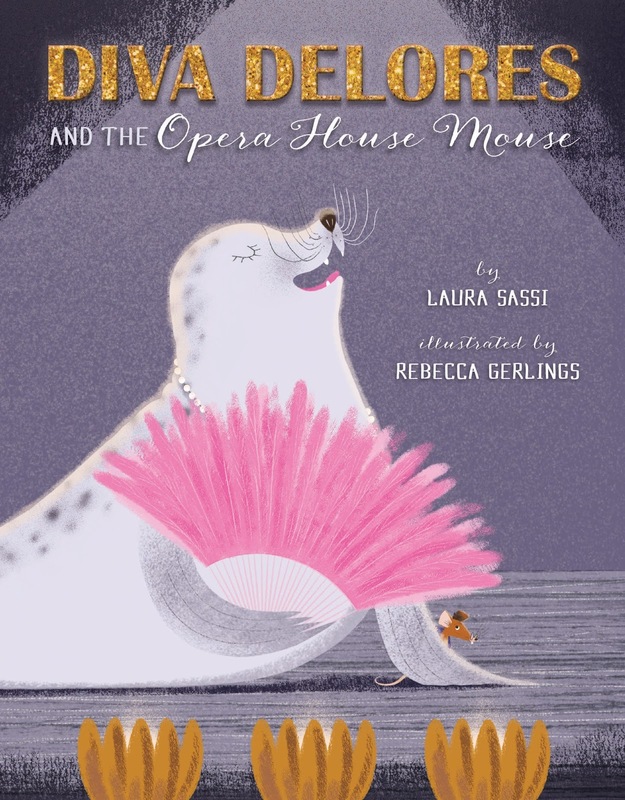 By using opposite background colors (gray and white) for this spread, Rebecca cleverly and effectively sets up from the outset the very different life goals and perspectives of Diva Delores and that adorable opera house mouse, Fernando. at the Old Opera House. I feel compelled to add that I also love the glorious joy of the spread where Rebecca depicts Delores and Fernando singing on stage, but I don't want to spoil the story, so I don't want to comment too much on that one. Please note, however, that this is the spread that I have chosen to have framed so it can join the collection on the special wall in my house that showcases illustrated spreads from each of my published books. If I might not know how to contact you, please leave an email address or link to your social media site. 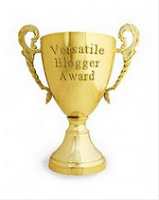 One lucky winner will get picked randomly one week from today -- on April 17 at 11:59 pm EST. Good luck!! Dancing in the Rain--Actually a Monsoon!